What is this new amazing technology, 3D printing any way? You may have noticed everywhere you go, you are most likely see 3D ads or some kind of information related to 3D. At the time of this blog, there were 5.5 millions results when I searched for “3d printing”. The possibilities of what this technology can do is only limiting to your IMAGINATION. It blows my mind what 3D pritners can possibly do! If you are a creative person or want to create something, but you do know how, master this technology. There are so much resources you find from 3D Printers, How to make money with 3D printing and so much more. The future of 3D printing is very bright. 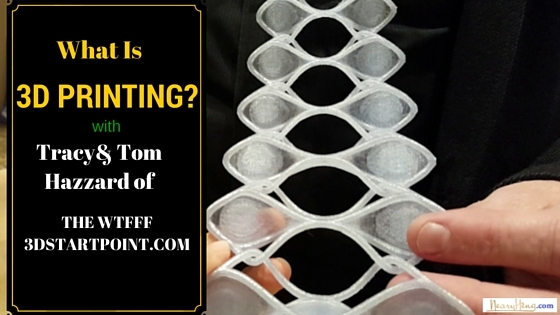 In this video, Tracy & Tom Hazzard of WTFFF 3Dstartpoint share their expertise so we all have a better understand of this technology. Where is the technology heading into the future? Important: Links to other posts, videos, etc. may be deleted as they can come across as spams. If you like this video helpful, please share your thoughts and ideas directly in the comments below. You’ll never know how your comment could help other readers. And share it with your family and friends by clicking on the social media links below.